The water in this shot reminded me of a birch tree. Wonderful observation, Mary! And a beautiful photo. Thanks for including the song! Boom didi boom boom... lovely! Mary MacADNski: The foreground is the river and the background, the sea. I love this spot and my viewpoint will end soon. My friend has sold her house. I'm helping her move so have only a few more opportunities here. My first thought was "That PEI Buddy of mine has been at the home-made Gin, again!" Mary MacADNski: Funny, but I can't see anything else when I look at it. Mary MacADNski: I do too. The tide was changing. 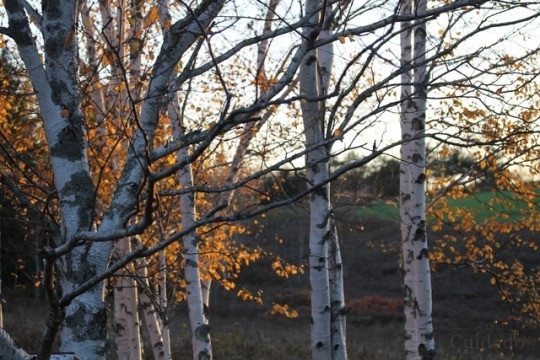 Mary MacADNski: I find it looks so much like the ditch birch. Mary MacADNski: It's uncanny, isn't it? This is a superb image.the reflection of the silver water and silhouette of the grasses make this picture. A charming song too. It sounds like something they might teach children to sing at school. Mary MacADNski: I remember the song from film we saw in school but it is taken from a poem that we did learn. Mary MacADNski: I was quite amazed at it. I see what you mean, Mary. A good observation. Mary MacADNski: I think it is quite uncanny, really. This is so good and love the light here. Fabulous point of focus here. Mary MacADNski: I will miss this spot. My friend has sold it. Mary MacADNski: It is a fabulous place that I will miss. A very evocative shot, Mary. Mary MacADNski: I like the resemblance so much.